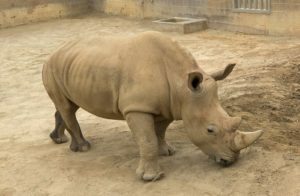 This is the first time that San Diego Zoo Global’s Rhino Rescue Center has been successful in initiating a southern white rhino pregnancy through artificial insemination. Northern white rhino genetic material maintained in San Diego Zoo Global’s “Frozen Zoo” is an important resource for attempting to re-build this nearly extinct species. You may recall Dr. Barbara Durrant’s 21 June 2017 presentation to the Lyncean Group, “Endangered Species Rescue: How far should we go?” In this presentation, Dr. Durrant explained the complex process being developed at San Diego Zoo Global to use northern white rhino tissue to create artificial embryonic stem cells that can be matured into northern white rhino egg and sperm cells. A northern white rhino embryo is created through in-vitro fertilization and then implanted into a southern white rhino surrogate mother. If the pregnancy is successful, this process will yield a northern white rhino calf after a 16 – 18 month gestation period. The process for developing the northern white rhino embryonic stem cells continues to improve. You can read a pre-print of the recent paper, ”Four new induced pluripotent stem cell lines produced from northern white rhinoceros with non-integrating reprogramming factors,” here. The authors, from the San Diego Zoo Institute for Conservation Research and The Scripps Research Institute, La Jolla, reported creating stem cell lines for four more individual northern white rhinos.